How does meditation relieve stress and for how long? How does m. . . Meditation is a necessity today. I believe it is the only way to be and live. A meditative state of living is the only best way to be able to face the ups and downs of life and the roller coaster ride that life is! It is the only way to stay sane and be efficient, productive, and to be able to find your life purpose. No wonder people ask: how does meditation relieve stress? First, know what meditation is. For me, meditation is not about sitting in a particular pose, in a quiet corner with eyes closed, trying hard to concentrate. More often than not, this is the image we conjure upon thinking of meditation. This way of mediation is certainly helpful, but for me, meditation is simply not something to do but to be! It is a broad concept rather than an activity and is a way of life to be developed and practiced every day...and then every moment! Yes, it is very much possible! Meditation helps bring harmony and alignment between body, mind, and soul, Hence, it benefits physically, emotionally, and mentally. Meditation for mental health is important, as it affects physical well-being too. 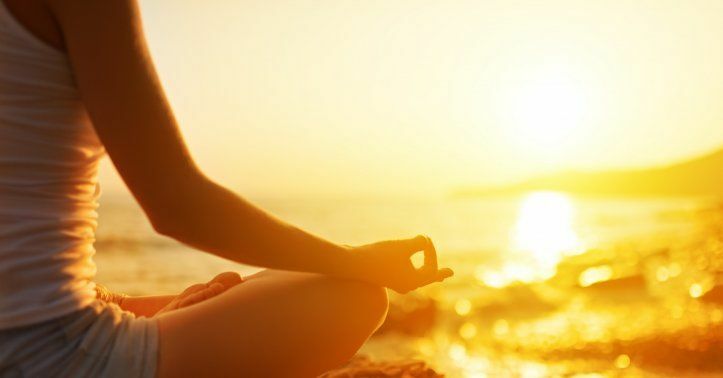 One of the main benefits of meditation is that it helps relieve stress. But how does meditation relieve stress? Meditation simply trains your mind to be calm, especially in times of stress and anxiety. Instead of reacting to stress, a meditative mind learns to observe the happenings and events as they are. Meditation helps relieve stress in a balanced and simple manner. Research and studies indicate that meditation has a huge positive impact on the brain. It helps alter the neural pathways in the brain, making them resilient to stress. Meditation simply relaxes you and helps you achieve a tranquil state of mind. This relaxation helps in relieving stress and anxiety. It soothes nerves and relaxes your tensed mind and being. Mediation helps in bringing attention to a single point of focus. This focus further helps in clearing away unwanted and stressful thoughts and worries in your mind. Meditation helps you in being and focusing on the present moment and in being mindful. Being totally aware of and in the present moment, by itself, helps relieve stress drastically. Relaxation, calmness, and focus brought about by meditation helps in reducing negative feelings and emotions like anger, fear, hatred, worry, and more. This further helps in reducing and relieving stress. Meditation helps you get a better understanding of yourselves. The more you practice meditation, the more you understand yourself and your thought patterns. You are then able to develop skills to be able to manage stress better. Those wondering how does meditation relieve stress and for how long will be pleased to know that its effects linger on for exceptionally long time. The calmness achieved during meditation stays with you and, if practiced regularly, helps in having a stress-free life. Don't worry if you have never meditated before. With the best meditation techniques, you can meditate like a pro. So, there is no doubt that meditation is the perfect way for stress relief. Being an inside process, with no dependence on external factors, meditation helps you remove the problem from deep within your subconscious. We learn to take responsibility for our own mental state by regularly training our mind to be positive and responding to various stimuli, triggers, and events in a positive manner, we can all reduce stress present in our lives. In a nutshell, when practiced regularly and consistently, meditation is the perfect solution to problems of anxiety and stress. It can make your life free of tensions and stress. It can enhance your well-being and quality of life. So, time to ask: "where is a meditation coach near me?" Meditation is the best way to achieve inner peace. Start meditating today!